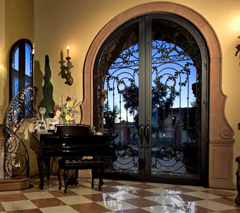 Colletti Design's entry doors, wrought iron gates, driveway gates, staircase railings, iron grills, ornamental garden gates and other iron products are all Made in America. We do not outsource our manufacturing. Everything we create is designed and built at our Tempe, Arizona factory by skilled craftsmen.